A group of friends are on a camping trip in the rural backwoods, with no phones, no technology and no contact with the outside world. Unbeknownst to the group the world has succumbed to a zombie infestation – something they soon discover when they come upon an abandoned farm and one the the group is bitten by one of the infected and turns into a rabid blood-thirsty, 28 Days Later-style zombie killing machine. Only these zombies tend to bite the dust after a few hours. Hence the films title! The zombie genre is THE most overcrowded of all the horror subgenres. Its seems ever filmmaker has at least one zombie story to tell, and most of the time they’re as derivative as the last one. Honestly, when was the last time – especially when it comes to direct to market films – that you saw an original zombie film? I can think of a few in the past couple years (off the top of my head, and I’m sure someone will point out more): Wyrmwood, I Survived a Zombie Holocaust, Zombie Resurrection… But what these three particular zombie films had was that they played with genre conventions. Wyrmwood took pieces from the horror and post-apocalyptic genres; Zombie Resurrection amped up the comedy to ridiculously non-PC levels; and I Survived a Zombie Holocaust returned to the blend of laughs and slapstick that made fellow Ozploitation horrors Dead/Alive and Bad Taste such successes. What does 3 Hours Till Dead bring to the table? Nothing much beyond the “three hours of life” premise – and that isn’t introduced until waaaay late into proceedings, which takes away completely from the idea that the films protagonists COULD wait this whole zombie infestation out,. But hey, if they did that there’d be no film right? Wrong. Having zombies “expire” after three hours and the protagonists knowing this would have given 3 Hours Till Dead an edge over the competition, character-based decisions would be made on whether the zombies have all died, whether newly infested people would rise and die just as quickly, there would be more intrigue instead of action… making this a distinct new take on the zombie movie – somewhere more along the lines of Assault on Precinct 13 rather than Dawn of the Dead. But 3 Hours Till Dead does none of that. Instead we get “zombies on a farm,” filled with the same cliches and stereotypes we’ve seen many, many, many times before. Sadly, any originality is jettisoned early from the film: including the fact the films eventual hero is an AWOL soldier suffering from PTSD. Whereas that could have made for an interesting psychological journey for the character it is instead almost used as a throwaway character flaw; in fact I found myself filling in the blanks, giving him more motivation than the filmmakers ever do. The only real “highlight” is that the film does not end on a happy note, for once the zombies win (sort of). But when a downbeat ending is the high point of your film, you know there’s something wrong. 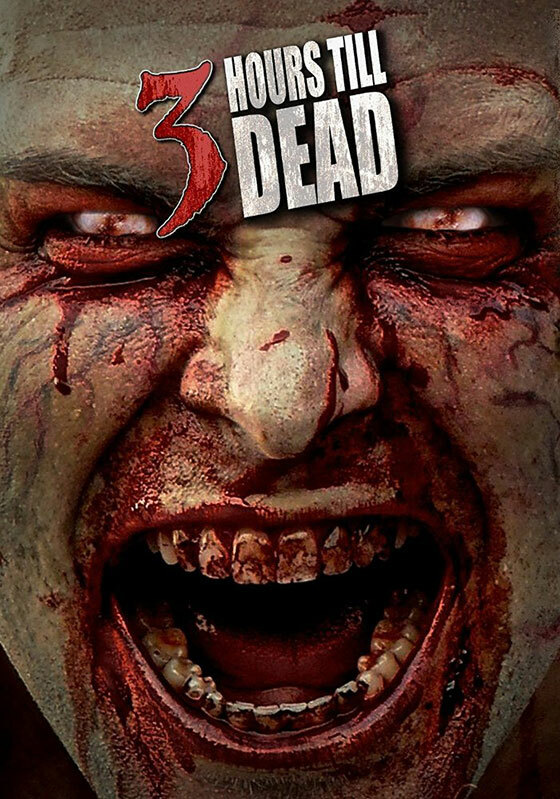 3 Hours Till Dead is out now on VOD and PPV from Sector5 Films.